LS, USSS General LeRoy Eltinge at dock. MSs, officers and soldiers of the 1st Brigade come down gangway of ship. MS, soldiers board truck. VS, trucks loaded with soldiers drive away from pier. AV, two ships at dock. Ambassador Maxwell D Taylor, General William C Westmoreland, and Vietnamese officer walk across field. They are greeted by Colonel James Timothy, CO, 1st Brigade, and Vietnamese officers. MS, Ambassador Taylor speaks with his son, Captain Thomas Taylor, who arrived with 1st Brigade, 101st Abn Div. Soldiers of the 101st Div in formation. Ambassador Taylor greets officers. LA, 101st Support Bn flag and the American flag flying from staffs. RV, dignitaries salute. Soldiers run across field in formation. MSs, paratroopers put on parachutes. ELS, lone paratrooper jumps from CV-2 Caribou and floats to the ground. LS, paratroopers jump from CV-2 and land in field. Paratroopers gather up their chutes. LS, USSS General LeRoy Eltinge at dock. Officers and soldiers debark from ship and board trucks. Trucks leaving dock area. MP directs trucks to make a turn. American flag is uncovered and unfurled with the 101st Abn flag. CU, color bearers holding staffs. C-123 taxis after landing. Ambassador Taylor, General Westmoreland, and others get off plane. MSs, CUs, Ambassador Taylor greeting and talking with his son, Captain Thomas Taylor. Dignitaries salute during Honor Guard ceremony. MLs, Colonel Timothy speaks to soldiers. MSs, Ambassador speaks. MS, General Westmoreland listening. TV crewmen and newsmen. Soldiers run across field in formation. Ambassador Taylor and General Westmoreland pose with other officers as civilians and military take pictures. 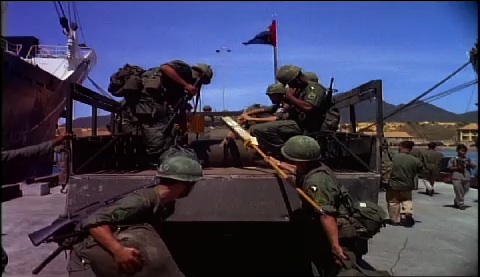 Chicago: “Vietnam: A Television History; Arrival of the 101st Airborne Division,” 07/29/1965, WGBH Media Library & Archives, accessed April 25, 2019, http://openvault.wgbh.org/catalog/V_5381554184D84FAC9C5E4DEFBF357173. MLA: “Vietnam: A Television History; Arrival of the 101st Airborne Division.” 07/29/1965. WGBH Media Library & Archives. Web. April 25, 2019. <http://openvault.wgbh.org/catalog/V_5381554184D84FAC9C5E4DEFBF357173>.